The plastic buckle is already attached to a pre-cut length of Polypropylene Strapping. Ideally suited for remote packaging and bundling applications. Our Pre-cut Straps are 1/2"x17' with a 300 lb tensile strength. Bucklestraps come in 6 colors. 1/2"X17" Strap with a plastic buckle already attached. Ideal for remote bundling applications. Not cumbersome tools required. 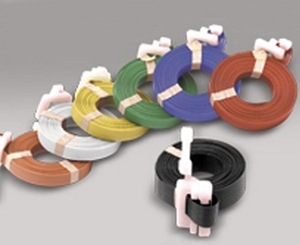 bpre cut polypropylene straps, Bucklestraps,PRE-CUT 1/2"X17FT POLYPROPYLENE STRAPPING, PRE-CUT POLY STRAPPING, pre-cut poly strap,Pre-cut Strapping w/buckle,Pre-cut Straps with buckle,Polypropylene Pre-Cut Pallet Strapping,PRE CORTADO 1/2 "X17FT POLIPROPILENO STRAPPING, CUT PRE POLY STRAPPING, correa poli precortado, Embalaje precortado w / hebilla, precortado flejado con hebilla, polipropileno Pre-Cut Pallet Strapping,1/2"